The Drexel men’s varsity eight boat won its race by over two seconds with a time of 8:02:48. Meanwhile, the women’s varsity eight boat dominated the field with a time of 9:21:52, coasting to a 27-second victory. After a spirited performance at the Rumson Boat Race Sept. 29, the Drexel men’s and women’s crew teams continue their season with the 2012 Navy Day Regatta Oct. 13, held on the banks of the Schuylkill River in Philadelphia. The Dragons will be going up against the likes of city rivals the University of Pennsylvania, Saint Joseph’s University, Villanova University and other teams from around the country. Drexel comes into this regatta on the heels of a great showing at the Rumson Boat Race two weeks ago. 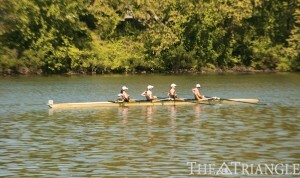 Drexel won three out of the four events on hand, including a clean sweep of the men’s and women’s varsity eight races. The men’s varsity eight defeated second-place Rutgers University by 2.5 seconds (8:02.48 to 8:04.83), while the women’s varsity eight won their race by a very comfortable margin, defeating second-place Villanova by nearly 30 seconds (9.21:52 to 9:48.9). The women’s second varsity eight also won their race, but the Dragons were denied a clean sweep of all proceedings when the men’s second varsity eight lost to Army by the slimmest of margins. Nevertheless, Director of Rowing and head men’s and women’s coach Paul Savell was happy with his team’s efforts.